Size The size of the text in points. FontName The font name. If the FontName gets an invalid string assigned the standard system font is used by default. FGColor The color of the caption text. BGColor The color of the caption background. The BGColor entry is ignored if Transparent is TRUE. Transparent The landmark caption becomes transparent if set TRUE. dx, dy The offset in pixels between the landmark position and the reference point of the caption. The positive direction for dx is from left to right, for dy it is top to bottom. Direction The direction of the text in degrees. Zero degrees is from left to right, 90 degrees is from bottom to top. VAlignment Vertical alignment of the caption (relative to the reference point). Allows values are vaTop, vaCenter, and vaBottom. 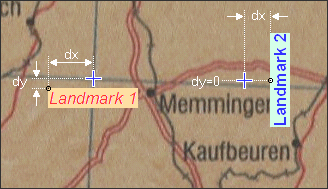 The following figure shows two landmarks, their captions and the corresponding reference points (indicated by a small black circle). The location of the reference point depends on the HAlignment and VAlignment parameters. The left landmark uses HAlignment := taLeftJustify and VAlignment := vaTop, the right landmark uses HAlignment := taCenter and VAlignment := vaTop. Please note that the offset [dx,dy] is always in pixel coordinates and that dx is always the horizontal offset, and dy the vertical offset, regardless of the direction of the label.